Kingdom’s Quest spans the time of Paul’s missionary journeys. Kingdom’s Quest is the fifth book in the series and spans the time of Paul’s missionary journeys. The central characters are Sir Gavin and Keanna. Sir Gavin discovers a new purpose in his role as a knight of the King and battles evil forces of the Dark Knight to bring the message of the Prince to the people of Arrethtrae. The Kingdom’s Dawn, Hope, Edge, Call, and Reign audio book/dramas are now available for purchase! Listen to the story of Leinad and Tess on CD as Andy Turvey and Dawn Marshall of Cheltenham, England bring the characters of The Kingdom Series to life. These are more than just a narration...they are audio dramas with a full original musical score, sound effects, and character voices that will capture the attention of all! 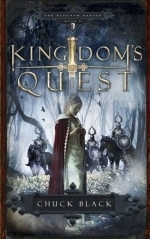 Each unabridged 3 CD disc set (4 CDs for Kingdom’s Quest) contains over 3 hours and 30 minutes of adventurous listening. Follow along word for word with The Kingdom Series books or just sit back and become part of the adventure!